Sunday January 13 1907 There was snow on the ground and not very pleasant so I did not try to go to church. I was busy about the kitchen all the forenoon. I read and wrote in afternoon and evening. Will about home most of the day. 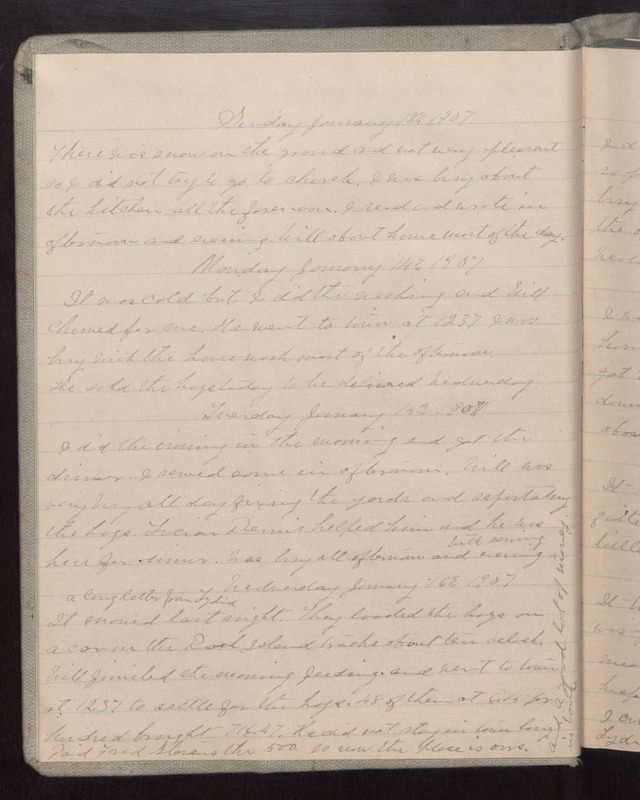 Monday January 14 1907 It was cold but I did the washing and Will churned for me. He went to town at 12.37. I was busy with the house-work most of the afternoon. He sold the hogs today to be delivered Wednesday. Tuesday January 15 1907 I did the ironing in the morning and got the dinner. I sewed some in the afternoon. Will was very busy all day fixing the yards and separating the hogs. Lucian [Denis?] helped him and he was here for dinner. Was busy all afternoon and evening with sewing. Wednesday January 16 1907 A long letter from Lydia. It snowed last night. They loaded the hogs on a car on the Rock Island tracks about ten oclock. Will finished the morning feeding and went to town at 12.37 to settle for the hogs. 48 of them at [6.15?] per hundred brought 716.47. He did not stay in town long. Paid Fred Stevens the 500. so now the place is ours. and a good lot of money in bank.